Norissa Harman and Jen Adams are two friends who are young, fashionable, and avid hunters. They grew tired of having to wear small men’s, and probably large boy’s, clothing while hunting. When you are out in the field hunting, ill-fitting clothes can cause many problems, such as exposed skin, being noisy, and restricted movement. They eventually expanded their clothing line to include hunting clothes, designed by women for women. At SHOT Show 2016, GWG debuted their new line of hunting attire. Harman and Adams, along with a few new additions to the GWG team, have personally field tested all items before they were sent into production. The clothes are designed to be form fitting, which will allow greater mobility in the field and prevent embarrassing mishaps. Clothes include everything from the base-layer to the outer jacket and footwear. Gear comes in variety of Mossy Oak patterns and are available in light- and medium-weight options. A line for waterfowl hunting was also introduced during SHOT Show as well as a line of rain gear. Despite the traditional camouflage, Adams and Harman were still able to get their own bit of flare the clothes by adding subtle details, such as deer tracks on the pants. These details keep the integrity of the hunting gear intact while allowing a fashionable twist to it that is appealing to women. Depending on the specific item, features range from tricot lining, moisture wicking, odor control, and waterproof-ness. The clothes have a nice weight to them and a soft feel which will make them comfortable without adding a lot of bulk when layering. 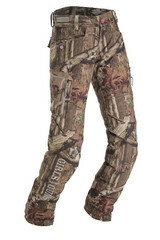 One of the most interesting items in their line of hunting attire is the pants. The pants are designed to have a low rise in the front, but a high rise in the back. The pants are also built with Velcro adjustments in the waist to account size fluctuations or multiple other layers. The most intriguing feature is the adjustable inseam. This feature allows for pants of one size to be wearable by almost all females regardless of height. This is also a benefit for the stores since they will not have to keep multiple inseam lengths in stock for each size. Unlike some women’s hunting attire, GWG carries a wider range of sizes from XS to XXXL (if you are only interested in their non-hunting clothes, the size range is still the same). 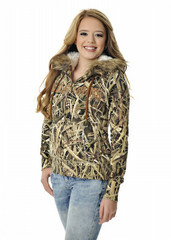 If hunting is not your thing, the fur hoodie is a popular choice. There is also a selection of 2nd Amendment and other patriotic shirts to show your patriotism. The spring catalog was recently made available as well, which means swimming suits are now available. Other athletic gear, such as sports bra tops and yoga pants are also available. GWG covers the entire female closet. Visiting the website to shop, you will find weekly specials as well as a sign-up for a newsletter. Looking through their line-up, it is easy to see that the clothes will appeal to young women from all over. By making the clothes wearable by women of all sizes, GWG will continue to find its way into homes.